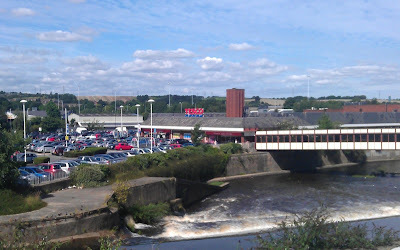 Until development takes place on the former Tesco site in Rotherham town centre, Forge Island is set to be used for markets and car boot sales on Sundays - the same day as similar events at nearby New York Stadium. Rotherham United secured planning permission in 2014 to use the existing car park of the £20m stadium on the edge of the town centre for car boot sales for 35 days a year. To be held on Sundays and Bank Holidays the plans showed that they could accommodate between 200-300 sellers. Launching this summer, the sales have been hampered by poor weather. Now Rotherham Council, which holds the markets charter and can licence rival markets where appropriate, has applied for planning permission that would allow Sunday markets and car boot sales for up to 52 days per calendar year on Forge Island. The site, which is being operated as a 220 space car park by the Council, will be available for use by up to 250 traders. The National Association of British Market Authorities (NABMA) awarded Rotherham first prize in the category of "Best Street / Outdoor Market" at their national awards ceremony in 2012. Since then, the outdoor market has added a fresh produce section and Rotherham Council's Markets Service undertook consultation with current traders and customers to establish the potential for extending the Tuesday street market from 62 to 95 stalls. A £48,000 investment was used this year to extend the street market to Effingham Square, which was revamped as part of the £40m Tesco development. Rotherham Council had earmarked Forge Island as the preferred site for a town centre cinema and theatre development but has recently been in discussions with developer, Evans regarding a potential office campus that would bring 2,000 new jobs to the important site. The Council has also identified that the outdoor market is underutilised and that there is potential for stalls to be relocated should a redevelopment opportunity come forward. Redevelopment to include new retail units has the potential to enhance the vitality of the markets complex.